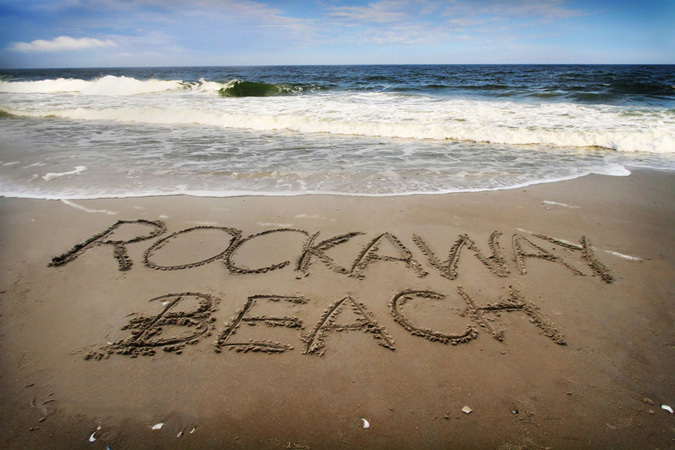 I’m a big fan of Rockaway. I’ve been going to the beaches there, off and on, for the past 20 years plus. I always felt that it was one of those New York City secrets that you only share with the closest of friends for fear that its greatness would be discovered by everyone and that would be the end of it. That said, it’s not the Hamptons or Montauk, and a few friends couldn’t get past the unpleasantness of the subway station or the environs on the 3- or 4-block walk to the beach. Oh, but the beach! 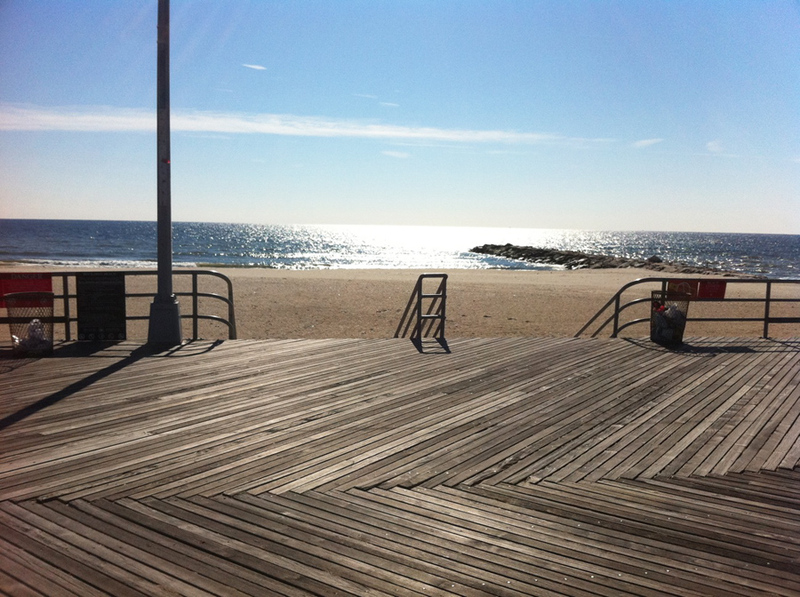 White sand, clean water, nice waves and a boardwalk to boot, all within a 1-hour subway ride from Manhattan. I always knew that it was just a matter of time before the masses would see its value and appeal, and sure enough, first the surfers started coming several years back to the beach at 96th Street, and now the hipsters (I mean this in the best possible way) and their Brooklyn eateries have infiltrated the boardwalk and beyond. It seems that all it took was this video about Andrew Field and his Rockaway Taco venture that floated around the internet last winter, and one or two New York Times articles. So, just to be clear, I am happy to join in the Rockaway celebration, but I will also be honest and say (shown above) that it’s a funny place. Beautiful beach, but new and old architecture that leaves a lot to be desired, as well as a much needed (and currently underway) facelift for the subway stops. 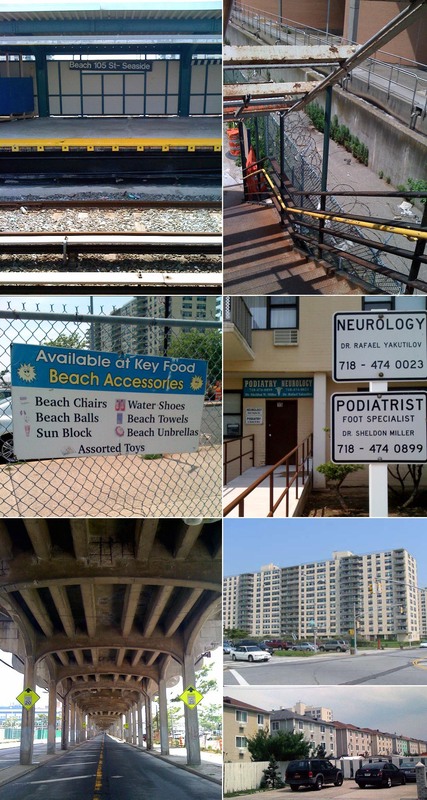 And, though all amenities from head to toe are at your fingertips – from the Keyfood to the Neurologist/Podiatrist office – it was definitely a nice surprise to show up last weekend at the 105th Street boardwalk burger stand and discover that it has been taken over by Caracas and Blue Bottle Coffee. Top photo: Frameworks Group; Tacos photo below: PacificStandard. What was most suprising was to see the incredibly long line, wrapping around the corner at Rockaway Taco on 96th Street. The tacos are tasty but, personally, I’d rather spend that extra hour or two on the beach rather than on line. For relatively decent fare and definitely equally excellent drinks I suggest going to the less hip waterside restaurants on 92nd Street right on the bay side. If you can get past the exterior decor or the McDonald’s next door, both the new Thai Rock restaurant (previously the Lobster House) and the Bungalow Bar next door, have decks with seating right on the water and boats anchoring up the side. Definitely not a wait (for now, anyway) and there you get to eat waterside a hop, skip and a jump from the 90th Street subway stop. Shhh…let’s keep it between us. Lastly, though I’m not sure how long a walk it would be over the Marine Pkwy Bridge, another nice option, is the Bay House in Rosedale. That might be best by bike or car. One of the things I like most about NYC is that it is always changing and evolving, so I’m excited to see what the Rockaway of 5 years from now will be like, even if it means sharing the sand with more bodies. This entry was posted in Food, Fun, NYC, Pop Culture, Stuff We Like. Bookmark the permalink.